Faraday's Law of Induction states that the magnitude of the induced e.m.f. in a circuit is directly proportional to the rate of change of magnetic field lines cutting it. The “rate” here is associated with the speed of the movement of magnet / coil. When the speed changes, the magnitude of induced emf will change accordingly. Note that when the question does not mention about speed, we do not need to explain the question with the “rate”. An explanation with “a change in magnetic field lines cutting the coil” is sufficient. The below illustration shows the meaning of a CHANGE in magnetic field lines cutting the coil. From position 1 to position 2, the number of magnetic field lines cutting the coil changes from 1 to 5, hence, there is an increase (change) in the magnetic field lines cutting the coil when the magnet moves from position 1 to position 2. Thus, an emf is induced during this movement. Lenz's law states that the direction of the induced e.m.f. (and hence induced current in a closed circuit) is always such that its magnetic effect opposes the change producing it. 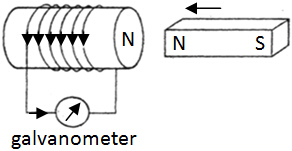 By Lenz’s Law, when magnet is inserted into the solenoid, a North pole will be induced on the right side of coil to oppose the incoming North pole. By Right Hand Grip Rule, the induced current will flow anticlockwise so that pointer deflects to right. By Lenz’s Law, when magnet is ﻿withdrawn﻿ from the solenoid, a ﻿South pole will be induced﻿ on the right side of coil to ﻿oppose the outgoing North pole﻿. By Right Hand Grip Rule, the induced current will flow clockwise so that pointer deflects to left. Note that although the direction of induced emf opposes the change producing it, it still occurs. This means the magnet will still go into the solenoid or leave the solenoid but it takes a little bit longer due to opposing force. The following analogy might help to understand the Lenz’s Law better. For example, your class is very united and close. Suddenly one student wants to study overseas, you will try to oppose this and wish him to stay. Nevertheless, he will still go overseas. Likewise, when another student suddenly transfers into your class, you try to against this initially, and yet the student still joins your class. Faraday’s Law gives the ﻿magnitude﻿ of induced emf while Lenz’s Law gives the ﻿direction﻿ of the induced emf. Lenz’s Law is an example of principle of Conservation of Energy. Mechanical work is done to against the opposing force experienced by the moving magnet, and this work is converted into electrical energy as indicated by induced current flowing in the circuit. (a) Explain why an emf is induced when the coil moves into the magnet. (b) Explain the direction of induced current in the coil. (c) Explain the effect on the magnitude of the induced current when moving the coil more slowly. (a) As the coil moves into the magnet, there is an increase in the magnetic field lines cutting the coil. By Faraday’s Law, this induces an e.m.f. across the coil (which drives an induced current (include this only if question asks for induced current)).